Just like a refrigerator extracts heat from the air inside it, an air source heat pump extracts heat from the air outside a building. Remarkably, it can function in this way even when the outside temperature is as low as -15° C.
An air-to-water system generates heat via your ‘wet’ central heating system. 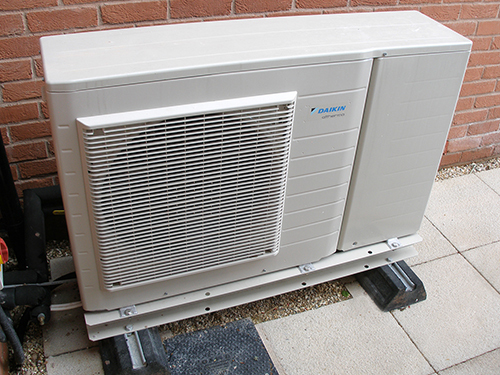 Heat pumps operate much more efficiently at lower temperatures than standard boiler systems. This makes them more suitable for under-floor heating or larger radiators, which give out heat at lower temperatures over longer periods of time. An air-to-air system produces warm air that is then circulated by fans to heat a building. These systems generally do not provide hot water as well. Heat from the air is absorbed into a fluid that is pumped through a heat exchanger. The refrigeration system extracts any ‘low grade’ heat, which is passed through a compressor and concentrated into a heat that’s capable of heating water for the heating circuits of a building. Air source heating systems can be easier to install than ground source systems, but efficiencies can be lower. None the less they will significantly lower domestic fuel bills and help to reduce a building’s carbon footprint. Once installed, they require little maintenance and no fuel deliveries. An air source heating system can make savings of up to 220% over a year compared to a conventional heating system. To achieve results like this, the system has to be correctly installed by experts. At Barkwell Plumbing and Heating, we can offer you all the expertise and advice you need when considering renewable energy options. We can help all our clients dramatically reduce carbon emissions by installing environmentally friendly systems such as these.